later, the Royal Navy would live up to its proud traditions. the shore establishment. Since I am not an expert on the RN, there is a chance I may misread info from the Navy List - if you spot an error please contact me to let me know. the German battleship Bismark in 1941. Hood was lost with all but 3 members of her crew. Photo from the Naval History and Heritage Command On-Line Library. As far as I know, this photo is in the public domain. 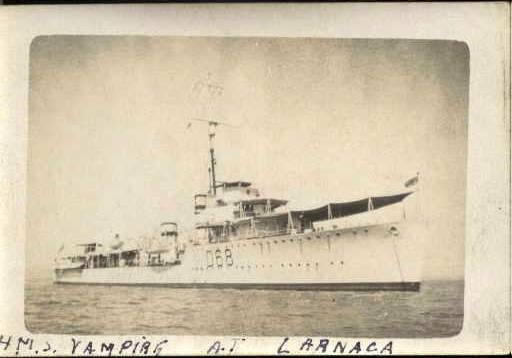 HMS VAMPIRE, "At Larnaca" in the early 1930's.